A Course in Monetary Economics is an insightful introduction to advanced topics in monetary economics. Accessible to students who have mastered the diagrammatic tools of economics, it discusses real issues with a variety of modeling alternatives, allowing for a direct comparison of the implications of the different models. The exposition is clear and logical, providing a solid foundation in monetary theory and the techniques of economic modeling. The inventive analysis explores an extensive range of topics including the optimum quantity of money, optimal monetary and fiscal policy, and uncertain and sequential trade models. Additionally, the text contains a simple general equilibrium version of Lucas (1972) confusion hypothesis, and presents and synthesizes the results of recent empirical work. The text is rooted in the author's years of teaching and research, and will be highly suitable for monetary economics courses at both the upper-level undergraduate and graduate levels. Benjamin Eden is a Professor of Economics at Vanderbilt University and the University of Haifa in Israel. He has published articles in numerous academic journals, including The Journal of Political Economy, The Quarterly Journal of Economics, and The American Economic Review. 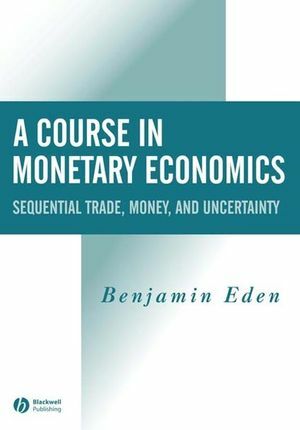 Professor Eden served for many years as a consultant to the Bank of Israel, and has taught monetary economics at various schools including Carnegie Mellon University, UCLA, the University of Iowa and the University of Chicago.